PennsylvAsia: Navigating the Intergener(ASIAN)al Gap, December 5 at Pitt. Navigating the Intergener(ASIAN)al Gap, December 5 at Pitt. 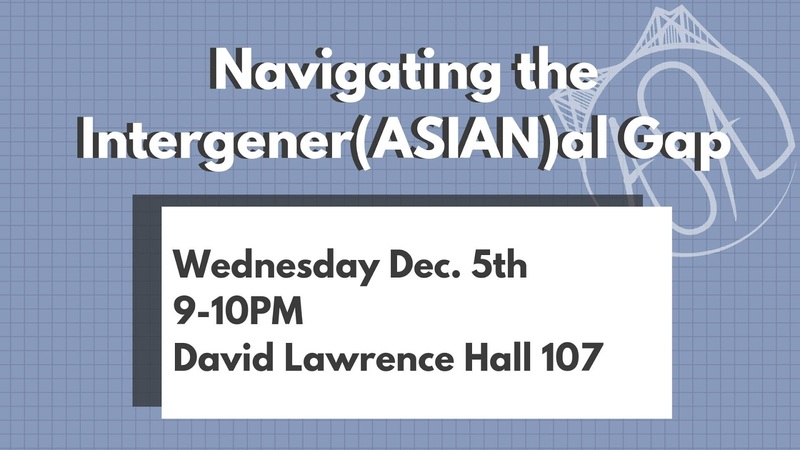 The University of Pittsburgh's Asian Students Alliance will host "Navigating the Intergener(ASIAN)al Gap" on December 5. Asian Americans tend to face many social and cultural differences between their relatives, especially when going home for the holidays. Within immigrant families, the differences between Eastern and Western culture in conjugation with a generational gap can lead to unpredictable results. Join us as we explore the similarities and differences between the generations of Asian American families, We hope to see you all there! It runs from 9:00 to 10:00 pm in 107 Lawrence Hall (map).